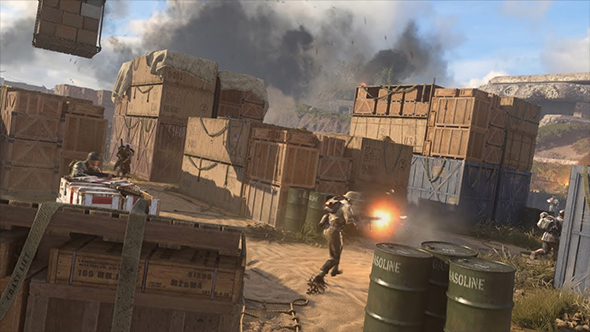 Hearing the word “Shipment” associated with Call of Duty may bring back either warm memories or horrific nightmares. Originally part of Modern Warfare, the tiny map hosts ridiculous deadly encounters that can be over in a flash. If you need your Call of Duty: WWII matches to move even faster, you’re in luck – Shipment has just returned. These are the best WW2 games on PC. Shipment 1944 has landed for all players today, retrofitting the cramped modern map for WWII-appropriate aesthetics. Otherwise, it appears quite similar to the original version. The map launched for season pass holders earlier in the week, but is now free for everyone across PC and consoles. For more details you can listen to a drill sergeant shout them into you via the trailer above, or you can just log in and play the map for yourself. If you’re looking for a more substantial update on the Call of Duty you remember, then keep an eye out for Modern Warfare 2 Remastered, which appears to have leaked via retailer listing. Otherwise, all eyes are on Black Ops 4 – sorry, Black Ops IIII – set to release this October.